With so many Timesheet apps out there how do you go about choosing the right one and what other factors should you consider other than focussing purely on price? Sure, everyone likes to get a good deal, but like most things in life ……cheap is not always better. Once your company has decided to take the plunge and move from paper to mobile Timesheets, you want to ensure that what you are buying is just that – smart Timesheet software that will fully automate the entire process for you, from recording hours worked right down to integrating the data with your existing payroll system. Moreover, you want to choose a system that your field crew will understand and want to use and that provides easy, accessible reporting to the rest of the business. In keeping with the entire FIELDFIX philosophy of working smarter not harder, our timesheets encourage field crew to capture information as they work. It may help to think of a timesheet as being like the old punch card system. Whenever the crew start on a job they ‘punch in’ using their mobile phone or tablet. In this way the crew can simply clock on to the job as they are setting up. If they forget they can send this clock on later and FIELDFIX will sort out the ordering and calculate the hours. Our clients find the main challenge is changing the culture within their business from paper to mobile, but with support from management and the FIELDFIX team, this change happens quickly. At FIELDFIX we are passionate about helping businesses utilise information the easy way with practical, no non-sense business reporting. That’s why as well as being user friendly, FIELDFIX Timesheets integrate seamlessly with FIELDFIX Job Management, so that time recorded is automatically reported to the relevant job. What’s more FIELDFIX Timesheets just got even smarter with greater flexibility and even more detailed reporting features. Our customers wanted to know more about what’s happening at the coalface so we added a “Job Comments” field. We’ve also extended the reporting features for Overtime and Allowances as well as improving the interface making FIELDFIX Timesheets even easier to use. Empower your field crew to help administrate your business from the field! So although there may be many Timesheet apps out there, be sure to do your homework first. After all, any business change takes time and a certain amount of effort so you want to make sure you get it right the first time. Send Timesheets from anywhere, anytime with FIELDFIX. Right for your field crew, right for your business. FIELDFIX Job Management makes light work of managing those ‘big’ complex jobs. Project Managers can easily plan complex commercial projects by using sub-jobs, tasks, dates and multiple job states to manage the work. For example, you can use sub-jobs to divide the job into tasks by crew function such as civil or drill, or by location such as by road. Even on-site, supervisors and project managers can assign tasks right there and then using sub-jobs so that they can use crew more efficiently to plan and manage the work. Sub-jobs can be easily scheduled and dispatched to crew devices in seconds and are easily managed through the job life-cycle with automated job flow, while alerts keep you on top of job progress by listing jobs that need to be actioned. With FIELDFIX jobs are more than just open or closed. FIELDFIX gives you the ability to easily manage the job through its multiple states e.g. on hold, open, quoted, approved, scheduled, planned, dispatched, in progress, work complete, reporting complete, invoiced, closed, cancelled. You choose the ones that best suit your business. Job states flow automatically depending on action e.g. as soon as data is submitted from a device, the job state moves from ‘dispatched’ to ‘in progress’. 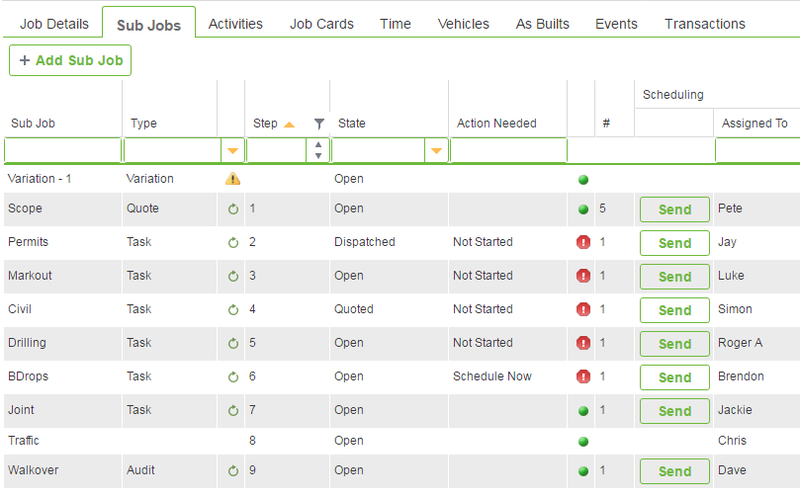 Automated job alerts tell you which jobs need servicing, and the shared view makes it easy to share comments between field crew and office staff. 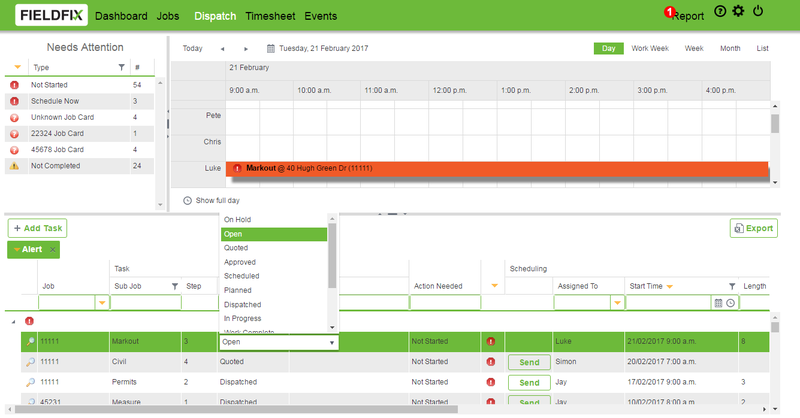 You can sort jobs by next date and quickly view recent job activity so that you can immediately schedule urgent jobs and dispatch to crew devices in seconds. FIELDFIX really does make it easy to plan and manage complex jobs, stay on top of job progress and easily track costs vs revenue in real time. When it comes to managing jobs in the field the smart way FIELDFIX gives customers the flexibility they need. First there were paper Timesheets, and then came mobile Timesheets. FIELDFIX goes that extra step further when driving the efficiencies of mobile information capture. 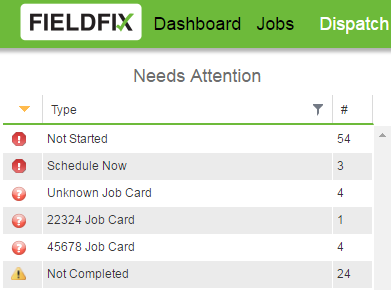 Listening to our customers, who wanted the ability to work even smarter in the field, we have expanded the capabilities of FIELDFIX Job Management to include capturing Time on FIELDFIX Job Cards. This means instead of completing separate Timesheets and Job Cards on mobile devices, field crew now have the flexibility to record both at the same time on just one FIELDFIX mobile form. The advantages of using FIELDFIX Job Management really do speak for themselves. Reduced administration all round as well as increased work efficiencies throughout the business. Site supervisors can manage jobs easier in the field without the hassle of paperwork. But for those cases when it makes sense for separate Timesheet only recording, FIELDFIX mobile Timesheets still do the trick. FIELDFIX couldn’t agree more. We focus on giving our customers the flexibility to capture and manage mobile information efficiently to suit their business needs. Providing customers with the tools they need to manage their jobs in the field the smart way!